Here’s a sweet surprise, courtesy of George Gershwin and improvisatory impulses that won’t be denied. In between sets on a recent Marty Grosz gig at The Mermaid Inn, two, then three players took the stand to explore LOVE WALKED IN: first Dan Block, alto, with Ed Wise, string bass, then Danny Tobias, cornet. Delicious results! 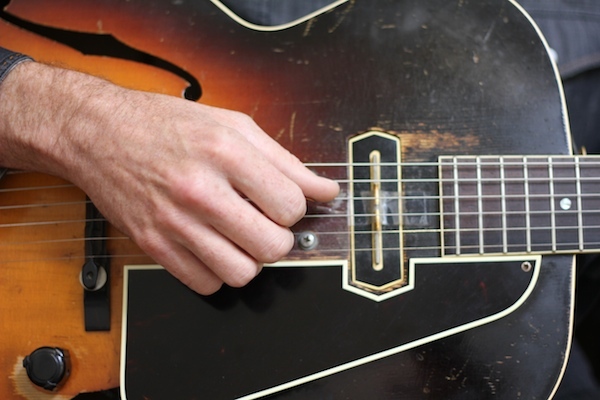 Once again, here’s an explanation — without words — of why improvising musicians call it PLAYING. 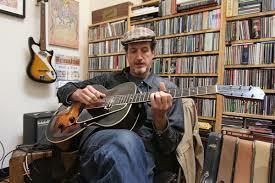 One of the pleasures of this 2013 California summer has been discovering this intimate, swinging duo — Michael Groh (whom I knew and admired from GAUCHO) on guitar and vocal, and Ned Boynton (new to me) on guitar. Learn more about Ned here. They played a lovely varied set at Amnesia in San Francisco on Sunday, June 2, offering the kind of relaxed, creative music that we always imagine musicians play when there’s a small audience of people on the same wavelength. Michael somewhat whimsically called this duo — a compact, intimate band — THE NEW EXCELSIOR RHYTHM BABIES, a spinoff from a larger unit. To get the full story, ask him on a set break. This photograph from the Burt Goldblatt collection was recently for sale on eBay. 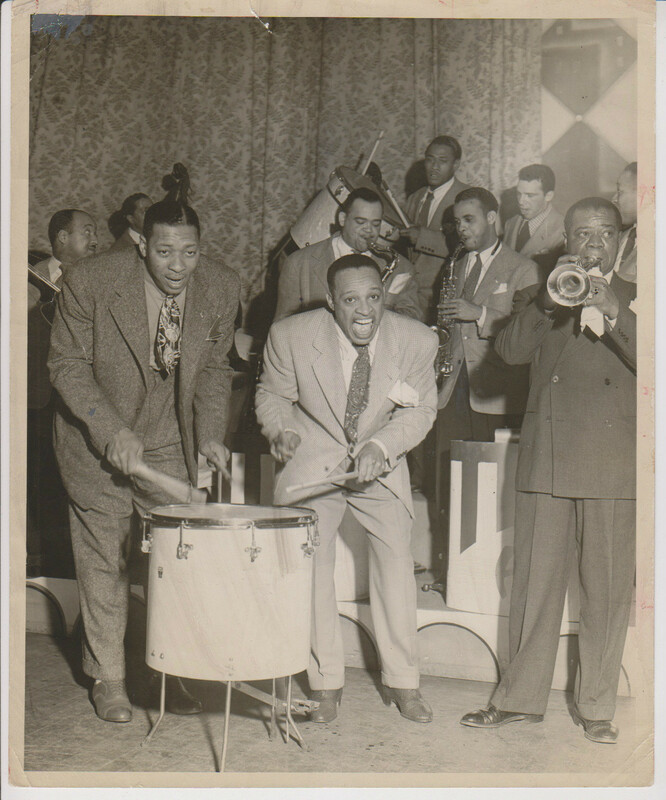 Sidney Catlett, Lionel Hampton, Louis Armstrong, Buddy Rich . . . and presumably members of Lionel’s big band, (guitarist Billy Mackel over Sid’s shoulder) — the scene is apparently the middle-to-late Forties. Louis is taking a breath between phrases or getting ready to play . . . half paying attention to something offstage? A keen observer pointed out to me that Lionel is wearing raised heels . . . Tall was always good. The photograph doesn’t come from the January 1944 Metropolitan Opera House concert (the more famous photographs from that occasion show a different stage and dark suits) but the soundtrack — for those who have the recordings — must have resembled the DRUM DUET that came late in the concert. I’m happy to report that this photograph is now owned by someone who not only knows how to hear the music but how to play it as well. 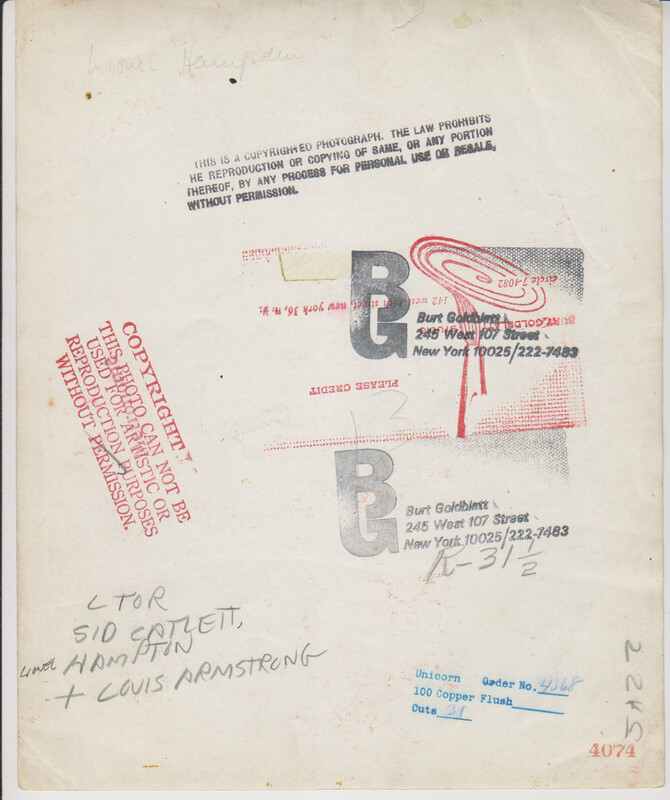 Anyone want to begin manufacturing Catlett – Hampton – Rich – Armstrong t-shirts?